If you live in Berlin, you’ve probably walked past a Video World store before but perhaps not even noticed it – it may well have blended into the terrace of launderettes, Spätis and banks. I, for one, was pretty happy to find out about this Videothek (an emporium of movies to rent and, in this case, games too). The first time I really, truly saw the place was on a second date, wandering around Schöneberg. The person I was on a date with informed me that it was a great place to buy snacks, and so we did. We bought the kind of gross, additive-addled sweets that I’m not sure I would have eaten even when I was eight years old. Although that little fling has long since fizzled out, Video World has been on my mind since. You know when you become aware of something and then you suddenly start to see it everywhere? There’s just one question that won’t leave me alone though. You see, Netflix and torrenting are both things that exist these days, so how, exactly, has Video World managed to survive? I suspect one factor could be the German fear of privacy violation. I come from the UK, where the general attitude to data protection is “YOLO”, so I can’t help noticing how almost every German I’m friends with on Facebook has a fake name (everyone else I know just has their real one, NSA be damned). There was also the time I saw a flyer for a new app pasted on a wall, stating that this app was available on Google Play and the iTunes Store. Someone had graffitied on it, “no thanks, those monsters only want your name, address and soul”. Netflix original series Orange is the New Black has just become available to rent at Video World. Although this testifies to the series’ popularity more than anything else, it makes contemporary entertainment accessible to those who’d prefer not to sign their lives away to the corporate giants. Then, of course, there is the retro kitsch aspect. As someone who loves a good B-movie (and C-movie… and D-movie… alright, I just love tacky movies), Video World really speaks to me. It all started when I was a young teen and every Saturday, my mother would let me borrow a DVD from the library as a treat. I think, back then, it cost 50 pence – definitely less than €1 in 2015. In those days, I think I jumped on any film that was set in California. My obsession with DVDs continued while I was at university – although, during that time, I pretended I was cool by getting out titles by directors like Pedro Almodovar. Then, once I discovered the gems of the 1990s – films like Empire Records and TV shows like My So-Called Life – I found myself realising there was an era of the past that I was perhaps too young for at the time, and wishing I could go back to it. Video World represents a tiny little bit of that place. To get in on the fun, you can join up in-store for a small fee and then get a membership card. After that, each title that you rent out is €3 or so. Notably, you get some money back if you return your item on the same day you rented it out. You have to be 18 years old to become a Video World member; this could be why its erotica section tells of an era long gone by. In a time of YouPorn, who would go through the humiliation of looking a person in the eye – a person who can see their membership card and therefore their name – and borrowing that? Well, those people are clearly out there and contribute to the upkeep of Video World. I do wonder what Video World’s average customer demographic looks like. 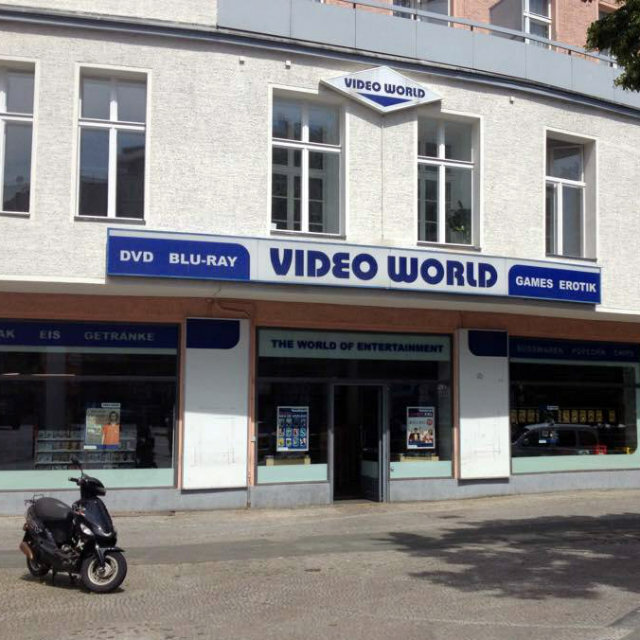 Video World only has stores in Berlin and a few other former East German cities, like Rostock and Leipzig. The company doesn’t have its own Wikipedia article, nor does its website give any information about the origin of Video World, and the interface is more than a little outdated. If you think about it, though, that’s pretty clever – since the place is shrouded in mystery, it means you have to go in and find out what it’s all about, right? It does have Facebook and Twitter accounts, but follower engagement is minimal; their posts consist mainly of updates about what’s “Jetzt neu bei uns”. But are all of those things truly necessary for a business’s survival in this modern age? Skeptics and digital marketers might respond in the affirmative, but Video World is solid proof that you can live off the grid and still stay somewhat up to speed with the film world.